Please email Lora with the subject "DEC. Winner" to claim your prize. lora at onecrazystamper dot com. Check back tomorrow as we kick off a new challenge and offer a new prize!! Lora here with you today, I'm filling in for Sue as she is under the weather!! The timing is perfect though because I wanted a chance to say a VERY SAD goodbye to 4 lovely ladies who have been on the OCS DT for quite a long time. Cindy, Michelle Lisa & Joni we are going to MISS YOU very much!! I wanted to say THANK YOU for all you have done for OCS and we all hope you will visit us often!!! Please visit the blog on January 2nd and 3rd as we profile the 3 new gals that are joining the Team. We are looking forward to an exciting time in 2013 at OCS!!! Onto today's post....I am posting the card that I made for my daughter Emilee's 11th Birthday which was on Dec. 27th. 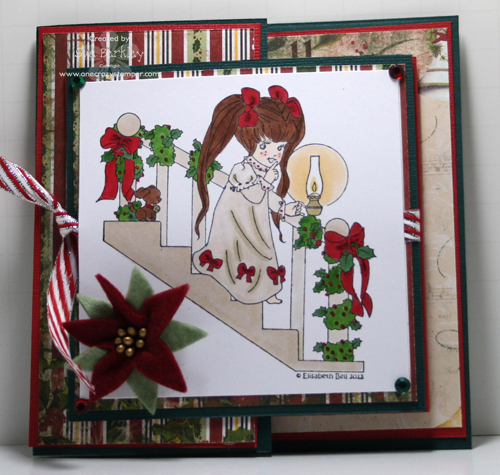 There is a cute little story that goes along with this card and a few more pic's to share with you. You can find my full post on my personal blog HERE! Wishing all of you a Happy New Year and many Blessings for 2013!!! Today is a very sad day for me. 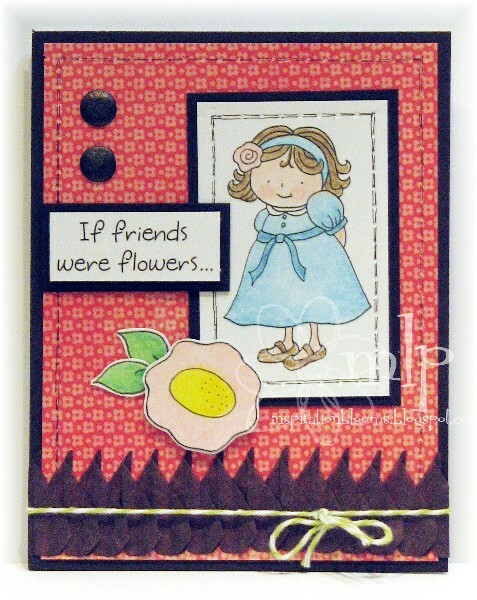 It is my last post as a one crazy stamper designer. I am excited to see the new team starting in January and wish Lora and the store the very best in the upcoming new year. This was one of the best design experiences and I really enjoyed working alongside these wonderful, talented ladies! I hope to join in some of the upcoming challenges and will be a lifelong customer! Thank you so much for all of your wonderful comments along the way on my creations! 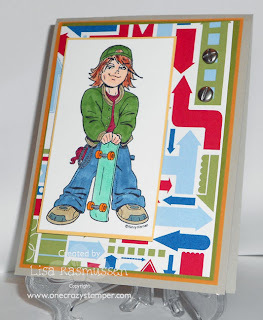 This is my last post for One Crazy Stamper. I have enjoyed being on this team. Thank you Lora for everything! I will keep in touch with OCS. 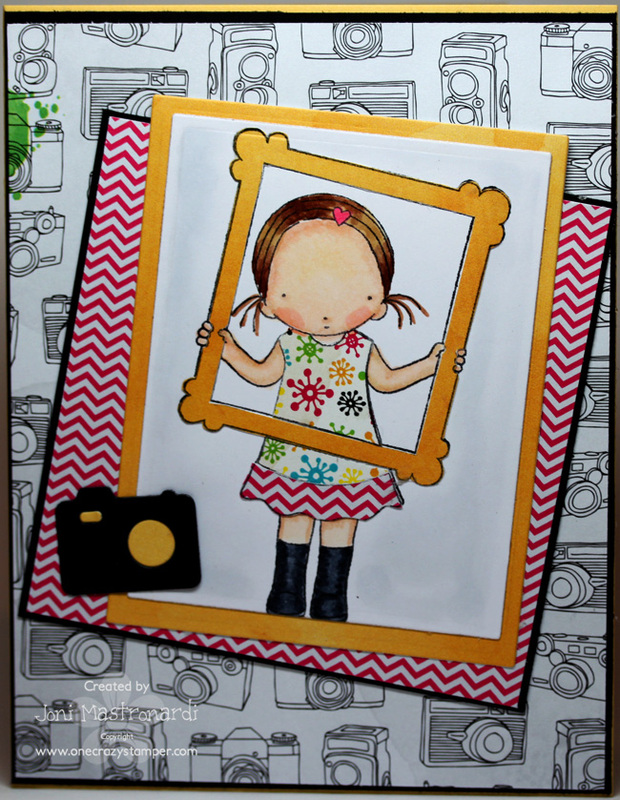 Today's card features Picture Perfect from MFT. I paper pieced the dress using American Crafts Amy Tangerine Sketchbook. Just a quick post today to show you all one of the newest beauties from Saturated Canary available through One Crazy Stamper!!! 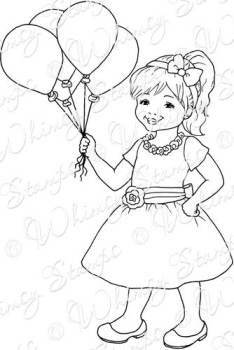 This is Cocoa colored with Copic markers on Copic Xpress It cardstock. The sentiment is from Whimsy Stamps Snowflake Mini Letter Seals, swirls are cut from the Rivera Corner Memory Box die, pearls were made with the Turquoise Viva Decor Pearl pen, and the embossing was completed with a Spellbinders M-Bossabilities Card Embossing Folder. 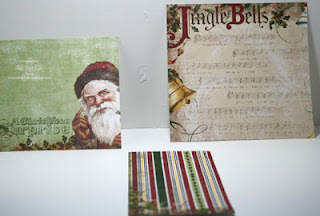 For today's post, I have once again combined both challenge themes to make this wonderful card celebrating the special meaning of today's holiday! 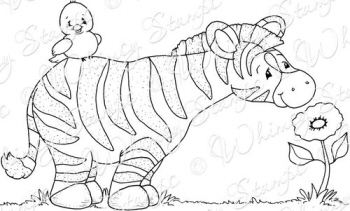 There are still a few days left to enter the challenge here to win three wonderful stamps, so click on the link at the top of this blog to see all the details. It's Sue here for another great Sunday and as Christmas Eve is almost here, I used this adorable stamp called Chloe's Little Light designed by Elisabeth Bell for Whimsy Stamps. 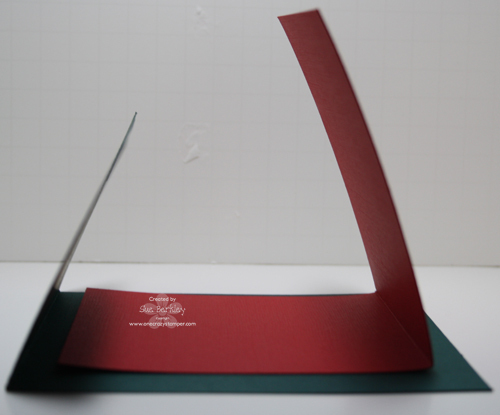 The first picture is the outside of the card while the second one is the inside of the card. 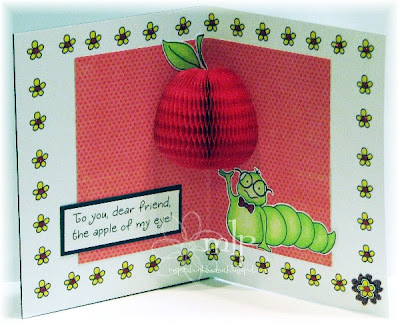 I saw the Joy Fold Card tutorial by Iris Wiechmann in the Whimsy Stamps Inspirations Magazine July 2012 Issue 9. Green cardstock - 2 pieces -- 8 1/2" x 5 3/8" and 4 3/8" x 4 3/8"
Red cardstock - 3 pieces -- 4 1/2" x 9", 5 3/8' x 5 3/8" and 5 3/8" x 2 7/8"
White cardstock - 1 piece -- 3 1/2" x 3 1/2"
Patterned Paper -- 6 pieces -- 4 1/4" x 4 1/4", 2 3/4" x 5 1/4", 5 1/4" x 5 1/4", 5 3/8" x 2 7/8", and 2 pieces each of 4 3/8" x 4 3/8"
Step 1: Score the 8 1/2" x 5 1/2" piece of green cardstock at 3" then score the 4 1/2" x 9" red cardstock at 4 1/2"
Step 2: Starting with the inside of the green cardstock add the piece of 5 1/4" x 2 3/4" patterned paper to the smaller side. 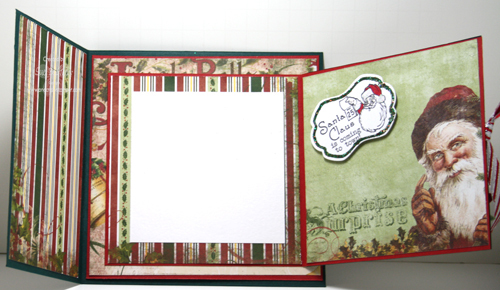 On the larger side first add the 5 3/8" x 5 3/8" red cardstock and then the 5 1/4 x 5 1/4" piece of patterned paper. 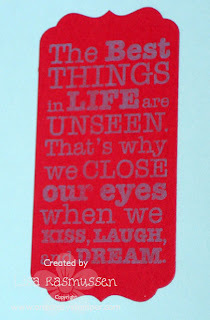 Step 3: Decorate the inside of the red cardstock with patterned paper 4 3/8" x 4 3/8" on each side. On the left side add the piece of white cardstock 3 1/2" x 3 1/2" for a personal message and a sentiment on the right side. 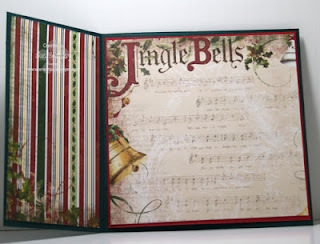 Step 4: To decorate the front of the card, adhere a green layered cardstock 4 3/8" x 4 3/8" with a piece of patterned paper 4 1/4" x 4 1/4" to the square piece and a red cardstock piece 5 3/8" x 2 7/8" and patterned paper 5 3/8" x 2 7/8" to the smaller side. 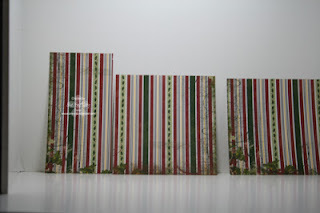 Before adhering all the layers of paper I added a piece of ribbon. 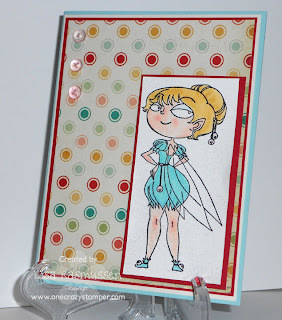 Step 5: Now that all the cardstock and patterned paper layers have been completed the rest of the card can be finished in the usual manner and add whatever embellishements you desire to. 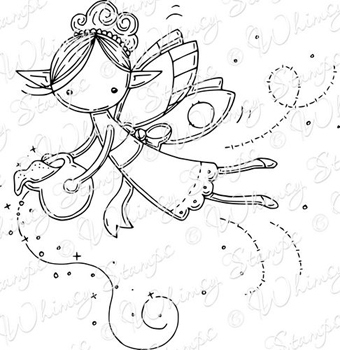 There is still a few days left to enter this month's challenge for a change to win a prize from One Crazy Stamper. A Merry Christmas and a Happy New Year to all. See you next week. I had a birthday card to make and I wanted it to be as far away from holiday colors as possible! 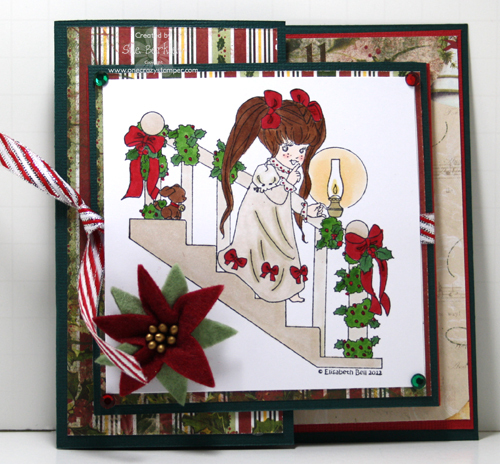 Used the adorable Rosabelle from Kraftin Kimmie. Hope you enjoyed the non-holiday post! Have a wonderful week! 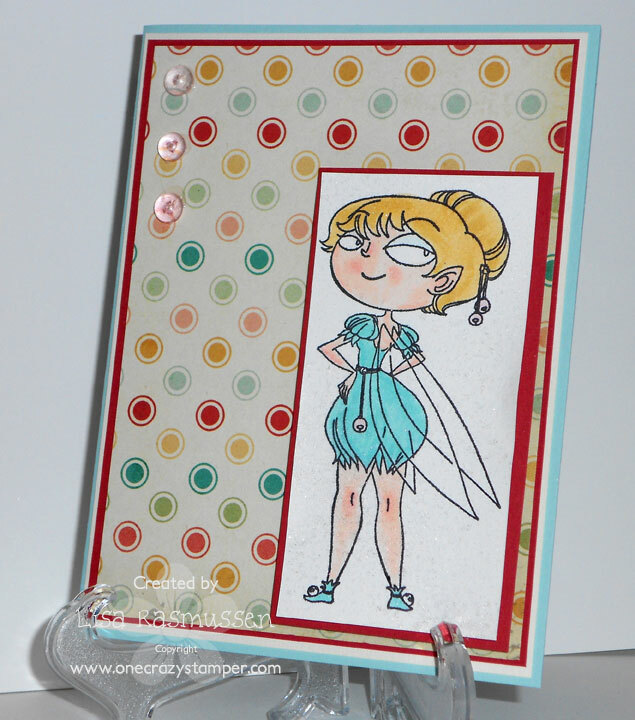 Today I have this adorable Nellie Snellen stamp Surprised available from One Crazy Stamper. I colored the image with the copics below. Dp is My Mind's Eye The Sweetest Thing. I added some pink lack trim and vintage yellow buttons. Hi all, Madge here for another Wonderful Wednesday at OCS. I'm in panics-ville mode as the "Most Happiest Day of the Year" approaches. I've decided to kill two birds with one stone for my post today........ Double Duty, so to speak. 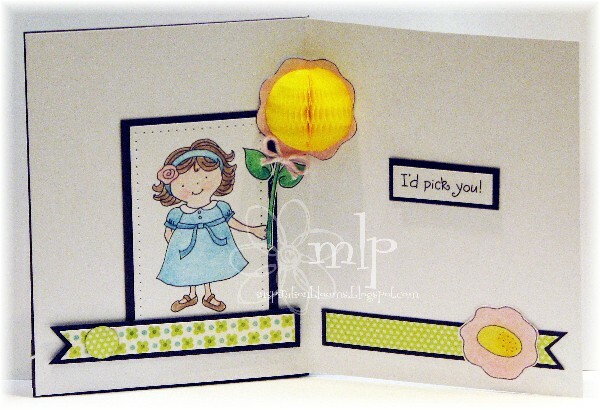 I've chosen the sweet Whimsy Stamp, "Holly" - available at OCS and turned her into a Nugget Candy Card filled with a Hershey's Nuggets surprise for a very sweet friend. This is #9 with three more to make before "the big day". These will be hand delivered - unlike two that were mailed! Yikes, that was expensive! I Stamped the image with Memento Tuxedo black ink onto Xpress It blend Cardstock and colored it with my favorite medium.....copic markers. Cardstock layers are from a stash of paper scraps that I have been neglecting to use. (I won't bore you with details). My picture is picking up reflections from the gold paper and glossy accents (not dry yet). 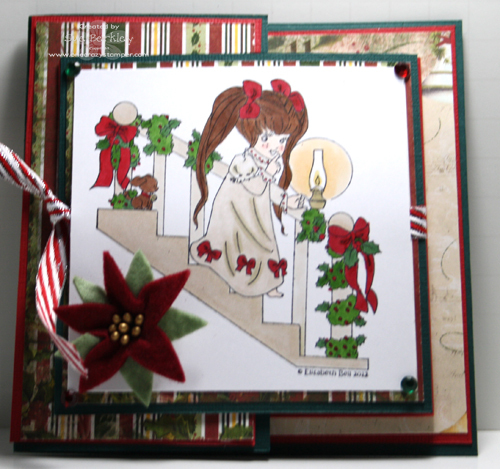 Whimsy's "Holly" stamp; Copic Markers; Memento Tuxedo Black ink; Viva Decor pen (snow); Cherry Lynn Fanciful Flourish;Glossy Accents; Stickles (on flowers) and Brads, flowers and punchies from stash. I apologize, but once again my links do not seem to be working without giving me an error message...... grrrrr. I want to wish all of you A Very Merry Christmas - from our house to yours. See you here next week. Don't forget to check out the challenge here at One Crazy Stamper and then get creative and enter to win a fabulous set of stamps!! I have another HoneyPop creation for One Crazy Stamper today. I just love the cute cards that can be made with these sets. This is the Pretty Posey set. 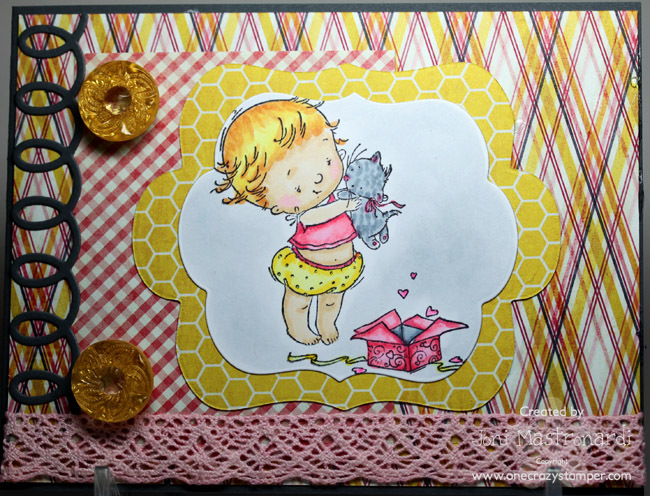 I used the yellow honeycomb paper pad for the flower center. On the front of the card I used my Inky Antics stamp set and a brown honeycomb paper pad for the front border on the card. 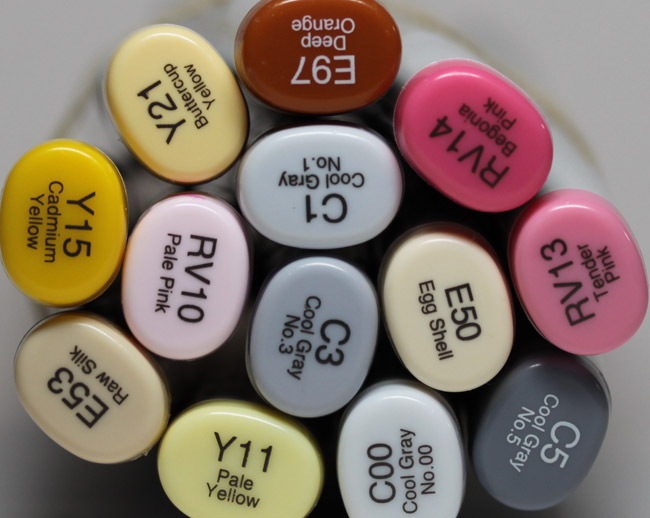 The image is colored with Prismacolor Pencils and Gamsol. It's Sue here with a quick card. Madge, I'm right there with you feeling the pressure. I still have the majority of shopping to do and the annual hand made present hasn't even been started; not to mention the housework. 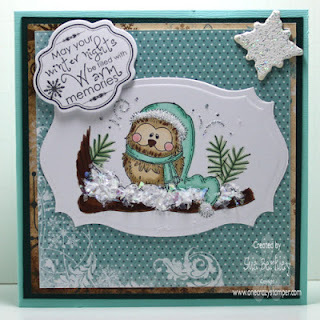 For my card today I have used this cute stamp from Whimsy Stamps called Cosy Winter Owl. Do enter this month's challenge for a change to win a prize pack from OCS. 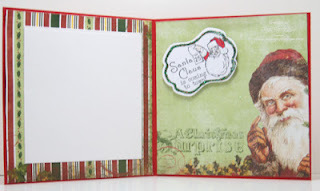 While you are at it, check out Lora's store One Crazy Stamper and start making your wish list for Santa. 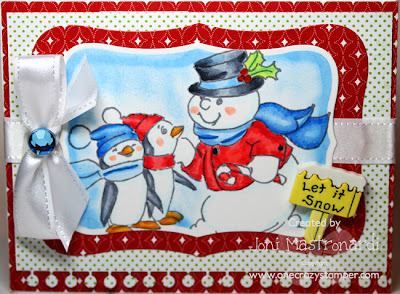 Today I have this adorable image Snowman with Penguins from Art Impressions available at One Crazy Stamper. I stamped the image with Memento Flannel Grey ink unto X press Blending card. I colored the image with copics: B21, B23, B24, B26, R29, R27, R22, C1, C9, C7 and C3. 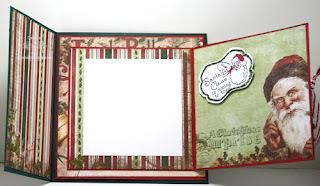 I used a Spellbinders label die to cut out my focal image Designer Paper is Bo Bunny Mistletoe Collection. Hi all, Madge here for a Quick Christmas Card. Are you feeling the pressure yet?? I am, with still a few special cards to make, baking, cleaning, etc. etc. I have a Quick Christmas Card for you today. The only stamping involved is the Merry Christmas sentiment. 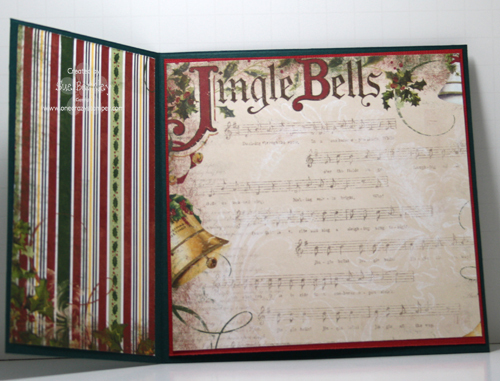 Die Cuts are Memory Box Dies, which are overlaid. I used double-sided tape on the ornament base, added Glitter Ritz glitter and pressed the overlay on top. I did the same for the silver edging. Much cheaper than purchasing those expensive sparkle sheets. Happy Monday! 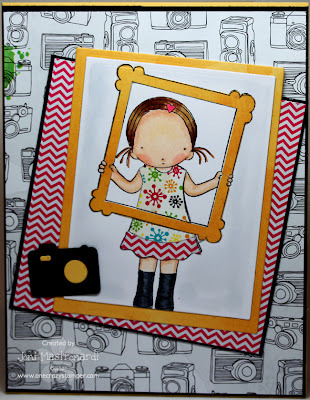 I have some Inky Antics goodness for you today for my One Crazy Stamper Post! I decided to go with this adorable HoneyPop set because this cute little fellow just makes me grin! He is colored in the traditional Inky Antics way; Prismacolor Pencils and blended out with Gamsol. I dressed the feller up a bit with a glittery bow that I fussy cut and popped on with a glue dot. Inside of the card is the HoneyPop surprise! The dear little fellow is holding up his HoneyPop apple. 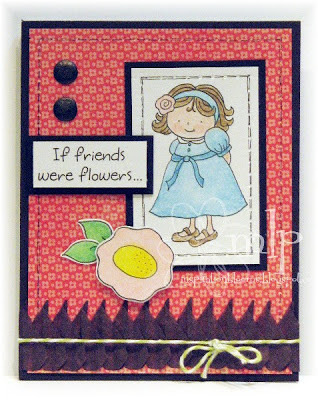 The flower centers bordering the inside of this card are glittered as well for an additional touch of fun! 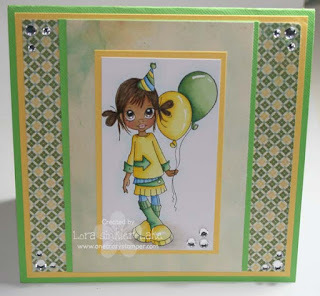 Papers for this card are from My Mind's Eye's Lime Twist Life of the Party and Fly A Kite collections. 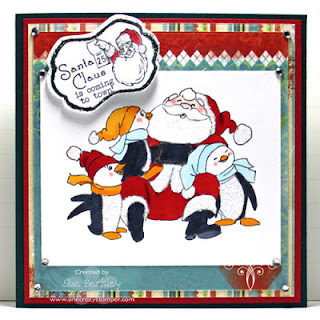 It is another fabulous Sunday, and for today's post for One Crazy Stamper I have used this cute stamp from Art Impressions called Santa and Penguins. There is still plenty of time to enter this month's sketch or holiday challenge at OCS. Do browse Lora's store OCS to make your wish list. Gift certificates are also available. This has been a very busy few months over here!!!! This is my last weekend to get studying because next week I have all of my finals. Whew! I was able to sneak away and get a little crafting done! It was much needed! I keep grabbing this image! I love it! It is perfect for teens and I NEVER can think of anything for them! I love Ryder Cole! He really just makes the card come alive all by himself! 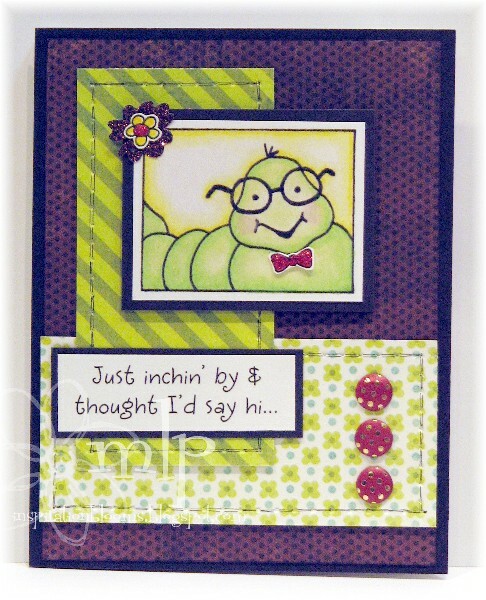 I used some fun paper in my stash and used those SUPER cool mini screw brads that are in the store!